Time for another classic post from the old site, while I'm at it… As we have seen in a bunch of previous posts, the notion of configuration space has held a prominent place in my mathematical explorations, because, I can't emphasize enough, it's not just the geometry of things that you can directly see that are important; it's the use of geometric methods to model many things that is. Consider all possible straight lines in the plane (by straight line I mean those that are infinitely long). This collection is a configuration space—a catalogue of these lines. What does that mean? Of course, in short words, it's a manifold, and we've talked about many of those before. But it always helps to examine examples in detail to help develop familiarity. Being a manifold means we can find local parametrizations of our collection by $n$-tuples of real numbers. How do we do this for lines in the plane? \] The variable m if you recall is the slope of a line, and b is the y-intercept which means where the line crosses the y-axis. However few people realize that what they're doing, really, is indexing every non-vertical line in the plane with some point in another plane (called, say, the mb-plane rather than the old traditional xy-plane). That is, we have a correspondence between points in one abstract mb-plane to the lines in the xy-plane, where m is the slope, and b the y-intercept. It doesn't get all lines, though—vertical lines have infinite slope, and you can't have a coordinate on any plane with an infinite value. That is, you have charted out the space of all possible nonvertical lines with points in a different plane. \] It's essentially obtained by reflecting everything about the diagonal line x = y and finding the usual slope and intercept. In other words we can chart out all non-horizontal lines on this new kc-plane. So you could represent the collection of all lines in the plane by having two charts... an atlas or catalogue of all lines, with these two sheets, the mb-plane and the kc-plane. \] that is, if $k = 1/m$ and $c = -b/m$, then $(m,b)$ and $(k,c)$ represent the same line in the two sheets. So to "glue" the sheets together, we glue every $(m,b)$ in the mb-plane to $(1/m,-m/b)$ in the kc-plane. Obviously the sheets need to be made of some very stretchable material, because it is going to be awfully hard to glue points together. Actually it's pretty hard to physically do this so don't try this at home, but just try to imagine it (don't you just love thought experiments?). For example, points in the mb-plane $(1,1)$, $(2,2)$, $(3,3)$, and $(4,4)$ get glued to the corresponding points $(1,-1)$, $(1/2,-1)$, $(1/3,-1)$, and $(1/4,-1)$. You glue them in a very weird way, but if you suppose for a moment, that you allow all sorts of moving, rotating, shrinking, stretching in this process (topological deformations), but without tearing, creasing, or collapsing, you can preseve the "shape" of this space, and yet make it look like something more familiar. This would be our new catalogue of lines. In addition, the catalogue has an additional property: nearby points in the catalogue translate to very similar-looking lines. One should wonder what kind of overall "shape" our nice spiffy catalogue has, after gluing together the two possible charts we've made for it. As it turns out, its shape is the Möbius strip! 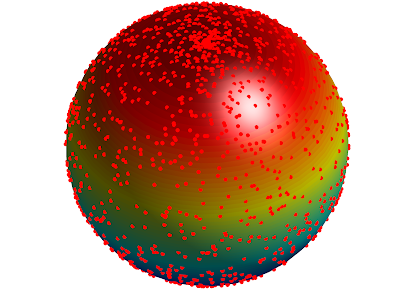 That's right, the classic one-sided surface (without, as it turns out, its circle-boundary). That is to say, if you give me a point on the Möbius strip, it specifies one and only one line in the plane. One would not, initially, be able see why non-orientability enters the picture. But a little interpretation is in order. First, if we take a particular line and rotate it through 180 degrees, we get the same line back. Everything in between gives every possible (finite) slope. It so happens that as far as slopes of lines is concerned, $\infty=-\infty$, and if you go "past" this single projective infinity, as they call it, you go to negative slopes. In other words, if you start on a journey on rotating a line through 180 degrees, from vertical back to vertical, you come back to the same line, except with orientation reversed (because what started out as pointing up now points down). If you fix an origin and declare that it correspond to a certain special line in the plane, and then select a "core circle" for the Möbius strip, then as you travel around this circle, the distance traveled represents rotation angle for this special line. 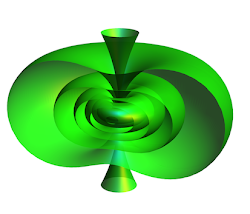 Traveling from the origin along the core circle and making one full loop should correspond to rotating the special line by 180 degrees. If you instead move up or down on the core circle, you instead end up sliding the line along a perpendicular direction, without changing its angle. So moving up and down the strip corresponds to parallel sliding of lines, and moving around the strip along a circle corresponds to rotating a line. \] We'll show how we got this in an update to this post, or perhaps a "Part 2." This can be readily checked by simply substituting the transition charts for $(m,b)$ and $(k,c)$. However, the extra case for $k=0$ here is simply gotten by taking the limit as $k$ goes to zero from above in the other case. 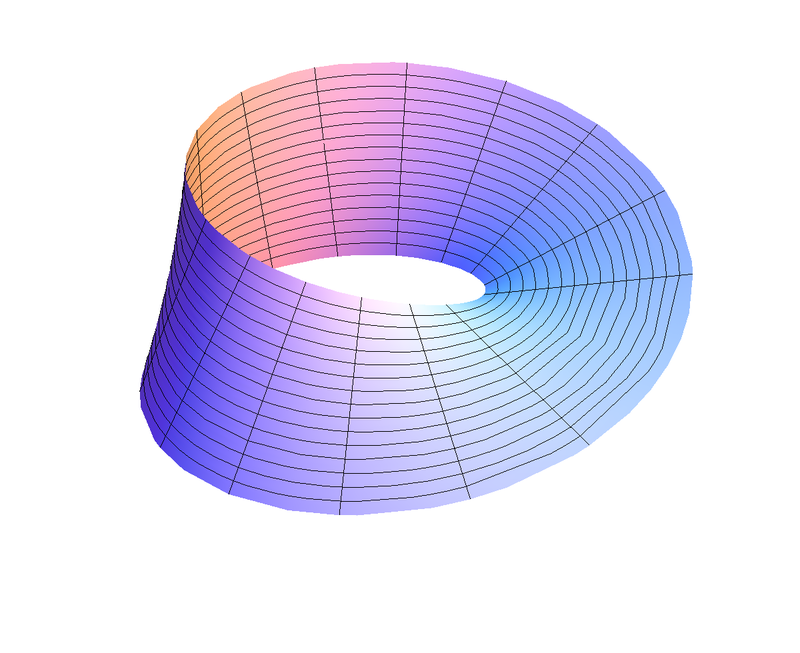 What proves that it is a Möbius strip is that, if we take the limit as $k$ goes to zero from below, it will approach $(\pi,c)$ instead of $(0,-c)$. This would make it discontinuous, unless we decide to identify $(\pi,c)$ with $(0,-c)$: the $c$ going to $-c$ means we take the strip at $\pi$ and flip it around to glue it to the strip at $0$ (see this post for another example of defining a Möbius strip this way). Technically, we need an infinitely wide Möbius strip for this, but we can always scrunch it down into a finite-width strip without its boundary circle (using something like arctangent). It's just that the closer you get to the edge, the quicker things go off to infinity. The more general object here we are describing is closely related to the notion of Grassmannian manifold, which are all $k$-dimensional subspaces in an $n$-dimensional vector space (the only difference is that Grassmannians only consider spaces through the origin).